The UW's Revolutionary, Liquid Nitrogen Automobile Could Put Electric Cars Out in the Cold. Abe Hertzberg wants to pull the plug on electric cars. The retired UW professor of aeronautics and astronautics rolls his eyes at the hype propelling these supposed vehicles of the future because, he says, they have just as many safety and environmental problems as gasoline-powered cars with a fraction of the performance. Hoping to stall the electric car bandwagon, Hertzberg and his colleagues set out to create a better alternative to grandma's gas-guzzling Gremlin. 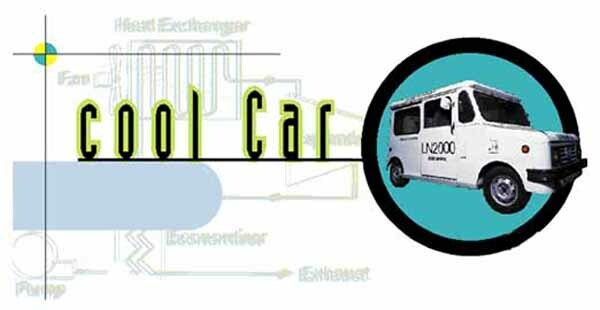 Inspired by a Li'l Abner cartoon depicting a car that runs on smog, the UW researchers invented a liquid nitrogen vehicle which generates no harmful emissions. As a bonus, manufacturing the liquid nitrogen removes pollutants from the air. "If you're going to talk about a truly non-polluting car, you have to do something different than gas or electric," explains Hertzberg. "We believe a liquid nitrogen vehicle can match the performance and range of an electric car, while still being affordable and easy to maintain and operate. And ecologically, it's a dream come true." 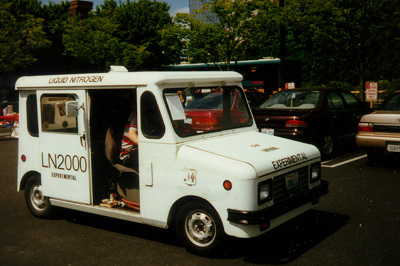 The outside of the LN2000 liquid nitrogen-powered vehicle is the body of an old Grumman Kubvan mail truck. The UW vehicle--dubbed LN2000--works sort of like a steam engine, except it is powered by vaporizing very cold liquid nitrogen instead of steam from boiling water. The nitrogen vapor turns an air motor to propel the car and then exits the tailpipe. Since the atmosphere already is 78 percent nitrogen, the environmental effect of driving LN2000 vehicles--even millions of them--would be virtually undetectable, Hertzberg says. What really excites this veteran researcher, however, is the potential of liquid nitrogen production to actually reduce air pollution. To make liquid nitrogen, Hertzberg explains, a plant would simply run air through a large refrigeration system and collect the liquid nitrogen as it condenses. In the process, pollutants such as carbon dioxide and sulfur dioxide also are removed from the air and could be disposed of in a benign manner. One option is to pump the pollutants into depleted oil and gas wells or into the deep ocean where they are unlikely to spread back into the atmosphere and cause environmental havoc. Fossil fuels would mostly likely be burned to power the refrigeration plant. But the exhaust from these plants would be trapped for use as the feedstock for the liquid nitrogen, so no pollutants would be released into the atmosphere. "We are not trying to promise an environmental free lunch," cautions Professor Adam Bruckner, who is working with Hertzberg on the LN2000 team along with Professor Tom Mattick, research scientist Carl Knowlen and graduate students Peter Vitt and Helene DeParis. "We are simply trying to point out a significant potential environmental benefit of liquid nitrogen automobile propulsion. Compared to other supposedly green automotive propulsion systems, such as electric cars, we think our approach looks pretty good."